Make: Electronics Kits Follow along with Make: Electronics 2nd Edition by Charles Platt and allow beginners to learn basic electronic circuits. Combined with our electronics kits you will have everything you need to complete the experiments in the book. They are excellent for teens and adults a like. As they are designed for the beginner looking to learn basic electronics the experiments start out very simple and progress to the point of learning to program microcontrollers with a Arduino Uno R3 for controlling things like home automation devices and robots. Out kits have been tested and approved by author Charles Platt and they are the only kits providing all of the electronic components for the whole book. 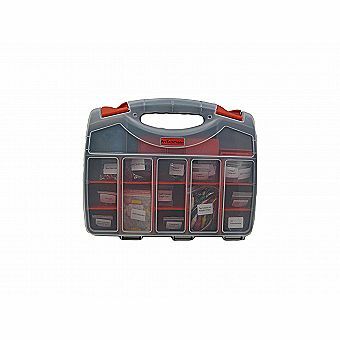 Double Sided Storage Carrying Case with over 30 compartments to keep your electronics organized - Configurable to hold your completed circuits as well. The ProTechTrader Make: Electronics Component Kit 1 has been designed to be used with the second edition of Charles Platt’s hands on learning book, Make: Electronics. Rounding up all of the necessary components can be time consuming and frustrating and we think learning electronics should be fun and exciting, so we’ve created the ideal component kit for experiments 1-11. The component shopping has been done so you can hit the ground running. You can rely on the ProTechTrader Component Pack 1 to supply you with the necessary components you’ll need for chapters 1 & 2 which cover experiments 1 - 11 of the Amazon.com Best Seller Make: Electronics: Learning Through Discovery 2nd Edition by Charles Platt and all are housed in a durable easy to carry double-sided plastic organizer. Each of the components are clearly labeled for easy access. Used in many school classrooms and is popular with STEM educational programs. The author makes this appropriate for beginners and adults with no electronics experience. The ProTechTrader Make: Electronics Component Kit 2 has been designed to be used with the second edition of Charles Platt’s hands on learning book, Make: Electronics. Rounding up all of the necessary components can be time consuming and frustrating and we think learning electronics should be fun and exciting, so we’ve created the ideal component kit for experiments 12-24. The component shopping has been done so you can hit the ground running. You can rely on the ProTechTrader Component Pack 2 to supply you with the necessary components you’ll need for chapters 3 & 4 which cover experiments 12 - 24 of the Amazon.com Best Seller Make: Electronics: Learning Through Discovery 2nd Edition by Charles Platt and all are housed in a durable easy to carry double-sided plastic organizer. Each of the components are clearly labeled for easy access. Get ready to have your breadboard buttered as The ProTechTrader Make: Electronics Component Kit 3 is finally here! This well thought out electronics kit is the last in the series and has been designed to be used with the ProTechTrader Make: Electronics Component Kits 1 and 2 in order to complete the experiments in chapter 5 of the Amazon.com Best Seller, Make: Electronics: Learning Through Discovery 2nd Edition, by Charles Platt. The components are housed in a 7.5"x6.5"x4.5" storage container that was specifically chosen as it can be used in experiment 29 as your speaker enclosure. In the final chapter of experiments, Charles Platt, with his hands on learning approach, introduces the topics of: audio, electromagnetism, radio-frequency devices, and programmable microcontrollers (Arduino, oh yeah!) using components many consider a bit difficult to source, but do not worry as we have you covered. We have taken the tedious time-consuming work out by rounding up the essential items necessary to complete experiments 25-34 which finishes out book. You can rely on the ProTechTrader Make: Electronics Component Kit 3 to put the necessary components in your hands as you expand your knowledge base and continue on the electrifying journey of learning electronics. Designed for your convenience each component is individually bagged and attached to an identification card including the parts name, electronic schematic symbol, and experiment number from Make: Electronics 2nd edition. ▪ Capacitors, Resistors, Trimmer Potentiometers, Switches, Rope, and More! The first edition of Make: Electronics established a new benchmark for introductory texts. This second edition enhances that learning experience with all updated and new experiments journying from the basics up to programming Arduino Microcontrollers by the end of Chapter 5 it is clear why Make: Electronics 2nd Ed is the best selling book on the market today for a beginner looking to learn basic electronic principals, circuit design, and now even microcontrollers and automation! "While there are some things that have barely changed at all," says author Charles Platt, "others are significantly different in this edition. The new visuals are undoubtedly the thing that readers will notice first. There's color on every page now, with over 350 images. "A new simplified section provides detailed advice on Internet searches and purchasing components," Charles says. "I think it's a lot easier to understand than the first book, but it's still completely hands-on. Every other book on electronics starts with theory, but I start with putting a battery on your tongue—just as with the original book."